15 When they had finished breakfast, Jesus said to Simon Peter, “Simon, son of John, do you love me—agape love—more than these?” He said to him, “Yes, Lord; you know that I love you—phileo love.” He said to him, “Feed my lambs.” 16 He said to him a second time, “Simon, son of John, do you love me—agape love?” He said to him, “Yes, Lord; you know that I love you—phileo love.” He said to him, “Tend my sheep.” 17 He said to him the third time, “Simon, son of John, do you love me—phileo love?” Peter was grieved because he said to him the third time, “Do you love me—phileo love?” and he said to him, “Lord, you know everything; you know that I love you—phileo love.” Jesus said to him, “Feed my sheep. In reality, when Jesus was asking if Peter loved him (agape love), and Peter was answering that he loved Jesus (phileo love), they both would have understood that their words were completely reasonable synonyms. The third instance in which Jesus asks Peter if he loves him (phileo love) is interpreted by the narrator, John, to be a repetition of the first two occurrences, in which Jesus uses agape (cf. Jn. 21:17). 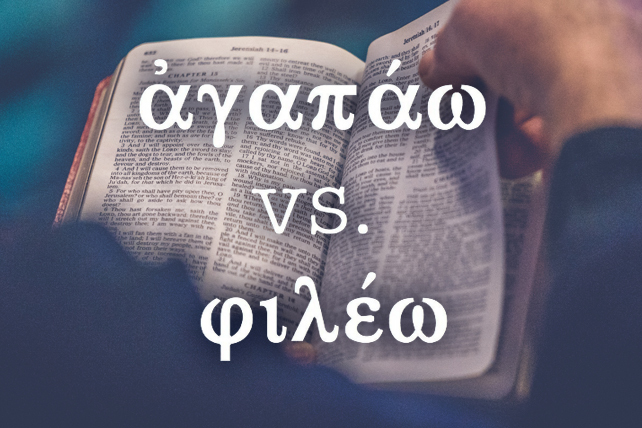 The point of Jesus’ thrice-repeated question to Peter is not secretly hidden from our English-speaking eyes in the use of two different Greek words. Rather, the point is that Jesus, sitting by a fire made with charcoal, fully restored Peter by giving him a three-fold opportunity to undo what he had done three times by another charcoal fire three chapters earlier (see Jn. 21:9 and compare Jn. 18:18). What Peter had done three times by the first charcoal fire (denied that he even knew Jesus) he reversed, with the help of Jesus, three times by the second charcoal fire (confessed his love for Jesus three times). Hover over these references to see them if you like (Jn. 3:16, 3:19, 3:35, 8:42, 10:17, 11:5, 12:43, 13:1, 13:23, 13:34, 14:15, 14:21, 14:23, 14:24, 14:28, 14:31, 15:9, 15:12, 15:17, 17:23, 17:24, 17:26, 19:26, 21:7, 21:15, 21:16, 21:20).